From left: Nicole, Jody, and Gina together before releasing Pritchard. 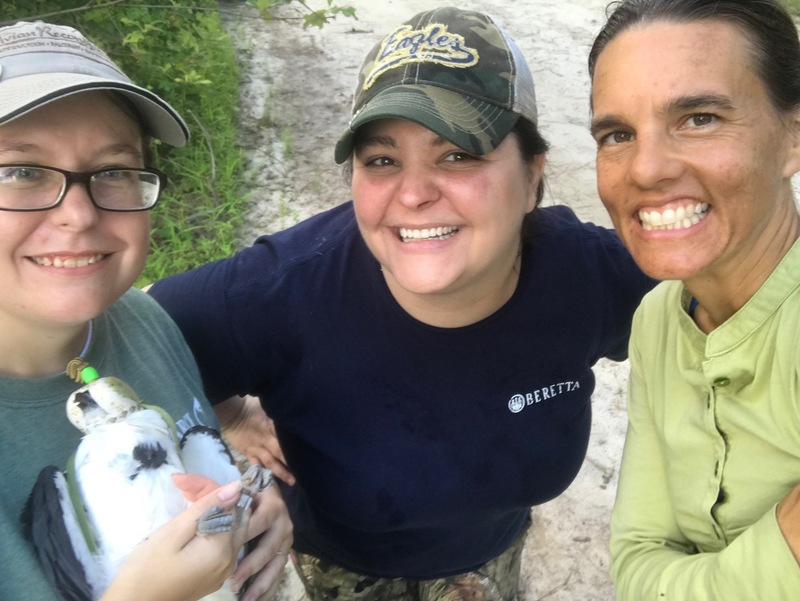 Early on 7 June, volunteer Nicole Jones and Trapper the Great Horned Owl made the trek from the Avian Reconditioning Center in Apopka, Florida, to Gainesville, Florida, to meet ARCI’s Gina Kent. The three of them continued on to Palmetto Bluff, South Carolina, where the plan was to tag another Swallow-tailed Kite. 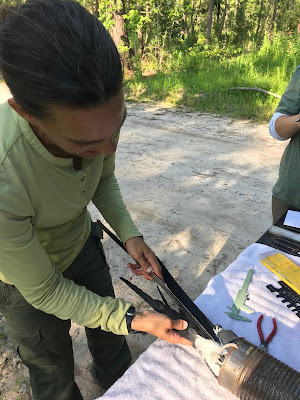 ARCI has collaborated with the Palmetto Bluff Conservancy on Swallow-tailed Kite and Great Horned Owl research studies since 2011, and currently have two Swallow-tailed Kites, Palmetto and Wilson, carrying transmitters through these efforts. The Friends of the Palmetto Bluff Conservancy has graciously funded the addition of another kite – now the 4th over the years – to our tracking program. Early the next morning Gina and Nicole were joined by Jody Warwin, our go-to colleague for kite and owl fieldwork at Palmetto Bluff, who made setting up the equipment a breeze in the pre-dawn light. We knew there were at least four Swallow-tailed Kites in the area, since we found two nests on the property this season. But, two of those kites are Palmetto and Wilson, and we did not want to capture them again. We set up the blind, placed the owl near the net, and before the three of us could even get in the blind, a Swallow-tailed Kite was overhead! Before long, Pritchard, named for the nearby community of Pritchardville, was in the net. Pritchard’s tagging represents a unique opportunity to study three nest-neighbors at the same time, and from their tracking data we see each kite has their own foraging area despite nesting so close together. Soon we will see what migratory paths they take to spend the winter months in South America. Palmetto, our tracking program’s matriarch, will embark on her 8th (!) migration this fall. Wilson will make his 2nd tracked trip, and Pritchard a maiden-tracked voyage. A big “Thanks!” to the Palmetto Bluff Conservancy, the Friends of the Palmetto Bluff Conservancy, The Avian Reconditioning Center, Jody, and Nicole for the support of this success! Once seen along the Mississippi River as far north as Minnesota, the Swallow-tailed Kite's range is now just a third its historic size. In the last 40 years, up to 80% of formerly common bird species have declined. ARCI works to develop management techniques for these at-risk birds, but we must apply them now, before their recovery becomes impossible. Since 1996, we have used satellite telemetry to study the ecology of Swallow-tailed Kites, including the 10,000 mile migration they make each year to the humid plains of Brazil and back to the lowlands of the southeast U.S.
Avian Research and Conservation Institute (ARCI) is a 501(c)(3) nonprofit that has gained attention and respect for difficult, problem-solving research on rare and imperiled birds. © Avian Research and Conservation Institute. Powered by Blogger.